By now, you’ve probably heard of those awesome little coffee cups known as the K-Cup. These single-serving coffee cups are easy and convenient to use – and there’s no mess to clean up! Who has the time to measure and grind up coffee beans in the morning when they’re half asleep? While these nifty little K-Cups simplify the coffee-making process, the cost of such a convenience can add up. K-Cups are typically a little less than a dollar for each one, depending on the brand and manufacture. Before you know it, you’ll be buying a box every time you go out, and it can get expensive. So just how did one of the financial experts at Consolidated Credit walk out of a local Staples with $85.94 worth of K-Cups PLUS an additional $2.11 in his pocket? Staples lets you stack coupons. You needed the right combo to make this work. Used a 50% off your entire break room supplies mobile coupon. The percentage off coupons is always taken from the original price, so the 50% off coupon break room supplies took off $43. Used $25 off a $75 purchase printable coupon. Then, because the original total is over $75, $25 was taken off. 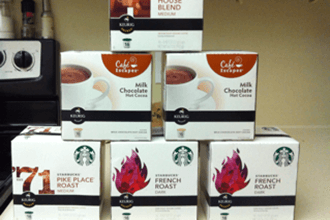 Used a $5 off any 2 Café Escapes printable coupon. Staples is running a deal this week where for every 2 K Cup boxes you buy, you get a $5 gift card. This will generate $15 in gift cards (same as cash, basically), so in the end it’s a $2.11 profit for a whole bunch of K Cups. The real value was the mobile break room coupon. It’s valid, one time use only, on everything in the store that is break room related (food, beverages, cleaning supplies, small appliances etc. ), and has no limit. Staples mobile coupons are on a 22 day sequence, the break room coupon comes on day 10 of Checking In. 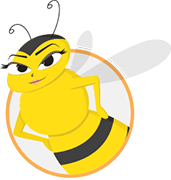 The frugal-friendly experts at Miss Money Bee urge all you coffee lovers to take advantage of this awesome savings technique! Enjoy!